UPR is now offering this complete Pro Series Rear Coil Over Kit for your 1979-2004 Ford Mustang. This kit allows use of the factory shock mounts so no welding or fabricating is required while allowing you the benefits of a coil over rear suspension. The main benefits from a coil over suspension is first reducing unsprung weight due to how much lighter they are in comparison to a stock style spring. Second is the adjustment in ride height either up or down allowing you to dial in your suspension for the conditions you'll be using the car in whether it's on the drag strip, road coarse or on the street. 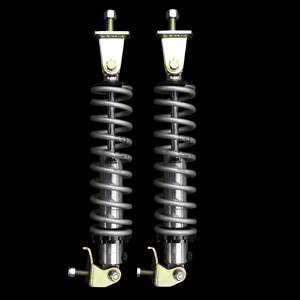 Viking Performance C209 Double Adjustable Coil Over Shock. 11.57" compressed height and 16.76 extended height. These shocks have 19 positions of compression and 19 positions of rebound adjustment for 361 different valving combinations. Lightweight aluminum twin tube design with sleek clear anodized finish. Shocks mounts are fully welded and zinc plated for corrosion resistance and durability. No one else gives you the bold clean styling of our Aftermarket Dress Ups, Suspension and Performance Parts for your American Muscle Car like UPR Products! Rear Coil Over Install Article from 5.0 Magazine Installs in 2 hours or less. Fits these Vehicles: 1979 1980 1981 1982 1983 1984 1985 1986 1987 1988 1989 1990 1991 1992 1993 1994 1995 1996 1997 1998 1999 2000 2001 2002 2003* 2004* LX GT GTS Mustang Cobra Shelby Roush Saleen Vehicles. * Does not fit Cobra with factory IRS. Made in the USA!